With the number of working ‘retro’ gaming consoles becoming rarer and rarer, collectors of such items may have to revert to alternative means of preserving such content, with the unofficial industry of ’emulators’ being one such method to roll back the years. One company, however, is attempting to offer a service that enables all former consoles to be played through their TV set while using up as little physical space as a computer-based emulator would. 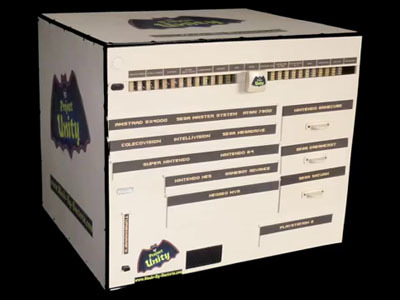 Bacteria, an English hardware modifier, have not put their creation up for sale due to licencing and time concerns, but nevertheless have formed an impressive-sounding console, the ‘Project Unity’, a single cube that is able to run games from across 18 separate platforms. Operating from a single power source, SCART output, and game controller, the system advertises 15 consoles which can be run through the device, noting the Amstrad GX4000, Atari 7800, ColecoVision, Gameboy Advance, Intellivision, NeoGeo MVS, Nintendo 64, NES, Nintendo GameCube, Sega Dreamcast, Sega Master System, Sega Megadrive SNES, Sega Saturn, and Sony PlayStation 2. Despite the difference in numbers between support and consoles featured, the Atari 7800, Gameboy Advance, and PS2 are all running in their full backwards-compatibility features, increasing the number of games permitted on the device, while the latter’s DVD playback feature, combined with the then-groundbreaking internet browsing capabilities of the Sega Dreamcast, should offer a little more to the system than just retro gaming.